The National Committee for Quality Assurance is a non-profit that, like many consumer advocates, works to improve health care quality. Quality means how well care meets each patient’s needs, access to that care and how patients’ experience their care. NCQA has several tools that can help advocates working toward our shared goal of high-quality, affordable care. These tools are a cornerstone of the nationwide effort to pay for the value, rather than volume, of health care that people get. NCQA began our mission in 1990 with Robert Wood Johnson Foundation support. At the time, employers wondered why rising health costs did not make employees healthier. The growth of managed care also created concern that capitated payments could cause insurers to skimp on care. We began to address these concerns with quality measures, the Healthcare Effectiveness Data and Information Set (HEDIS). The idea that we could measure quality was highly controversial then. Now, our quality measures are the most widely used and respected in the country. They are also a cornerstone of the broad and rapidly advancing movement to pay for value instead of volume. NCQA’s quality measures rate how well health plans and clinicians do at getting the right care to the right person at the right time. Our quality measures are the foundation of NCQA’s Health Plan Accreditation program. We use measures to rate a health plans’ clinical quality. We also rate the quality of patient experience, and review actual case files to rate how well plans enforce appeal rights, privacy protections and other critical consumer safeguards. We publicly report the results on our website to help people make informed decisions and hold plans accountable. What does value instead of volume mean? Traditionally, the health care system paid hospitals, doctors and other providers for the volume of care they delivered. This is known as “fee for service.” The more services patients got, the more pay providers got, regardless of how well those services improved patients’ health. This is now rapidly changing. Virtually all stakeholders today agree that fee for service rewards inefficient care while impeding high-quality, efficient care. Almost all health payers are thus working to revise payment to reward value. Value means giving patients the right care they need at the right time to improve their health. We measure and reward value by measuring how often the right care is given to patients. A coalition of consumers, providers, purchasers and insurers wants 75% value-based pay by 2020. Medicare wants 50% value-based pay by 2018. It has programs for Medicare Advantage, hospitals, fee-for-service physicians, and several demonstration projects. Most Medicaid programs have value-based pay. NCQA is America’s most widely used and respected health plan accreditor. Our program covers more than 169 million Americans, or 72% of all insured. We review actual patient case files to see if insurers enforce important consumer safeguards like allowing people to appeal care decisions, protecting a patient’s privacy and using science to make decisions on the right care for patients. We assess how well plans work to ensure access to care and help members understand and use their benefits. We score the quality of clinical care plans deliver using quality measures. We also score patients experience of getting care using the Consumer Assessment of Health Plans Survey (CAHPS). We strictly audit and publicly report results so everyone is held accountable. This “performance-based” approach distinguishes NCQA from accreditors that merely look to see if a plan has the right policies and procedures on paper. We charge health plans to obtain our standards and go through our program. We share the standards with consumer advocates, academics, government agencies and other non-profits for free on request. How does NCQA evaluate access to care? NCQA requires health plans to closely monitor out-of-network requests to identify network gaps. Some consumer advocates want plans to have specific numbers and types of providers at minimum distances from their members. NCQA does not require this because we have no objective data on what those numbers should be. Also, many underserved areas lack some specialties. We also expect plans to focus on obstetrics/gynecology in their network because of its high volume and oncology because of its high impact. Did you get care as soon as you thought you needed? Did a customer service representative give you the help you needed, and treat you with courtesy and respect? Did your doctor listen carefully, explain things in a way that was easy to understand and spend enough time with you? The federal Agency for Health Care Research and Quality leads CAHPS. NCQA uses CAHPS measures when we score NCQA Accredited plans. You can learn more about CAHPS here. How can I get NCQA Standards? We provide standards and specifications free to advocates, academics, government agencies and other non-profits on request. To get a copy, please contact publicpolicy@ncqa.org. Make more informed choices. NCQA rates and publicly reports results on health plans’ quality and consumer protections to help people make informed decisions about health plans. Accreditation holds plans accountable and makes them improve. NCQA-Accredited health plans perform better than other health plans. That’s because they know we score them on both clinical quality and patients’ experience of care. Accreditation holds plans accountable and makes them improve. The government requires plans to be accredited. The Affordable Care Act (ACA) requires its Marketplace plans to have NCQA-style performance-based accreditation, and over 80% of ACA plans have NCQA Accreditation. The Federal Employees Health Benefit Program also requires accreditation for its health plans. How do NCQA-Accredited Medicare Advantage Plans Perform Better? NCQA Accreditation is the most widely used and respected program because we get results. Medicare Advantage’s Star Ratings results show that NCQA-Accredited plans do better on prevention, treatment and member experience than other plans. You can look to see whether plans in your area have NCQA accreditation. You can urge government and other health programs to require and use NCQA’s rigorous accreditation and public reporting requirements. Twenty-five states already specifically require NCQA Accreditation for Medicaid and/or commercial plans. Another 10 formally recognize plans with NCQA Accreditation as meeting state standards. Medicare has deemed NCQA-Accredited plans as meeting some Medicare Advantage requirements, and you can advocate for Medicare to reinstitute and strengthen this program. You can submit comments when NCQA proposes annual updates to our standards each Spring to help us make sure we are addressing consumer concerns like yours in our decisions. How does my state use NCQA Accreditation? 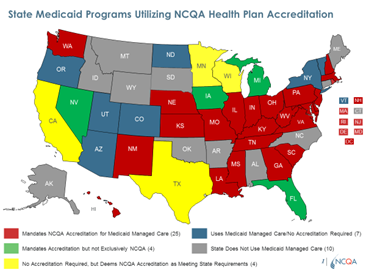 25 states exclusively require NCQA accreditation for Medicaid plans. 5 require accreditation and accept NCQA. 16 states us NCQA-Accreditation to meet some Medicaid regulations. NCQA maintains America’s leading clinical quality measures. These are the Healthcare Effectiveness Data and Information Set, or HEDIS.® They rate how well health plans and clinicians get the right care to the right person at the right time. We have distinct measures for patients in Medicare, Medicaid and CHIP, ACA Marketplace and employer plans. The measures use solid evidence about care people should or should not get. They evolve to address new issues and evidence and assess what’s most important to patients and others. Federal and state governments and most commercial insurers use NCQA quality measures. Quality measures support the movement to pay for value instead of volume. Value means getting the right care at the right time for each patient, rather than simply paying for how many services patients get. We give measure specifications free of charge to advocates, academics, government and other non-profits on request. How do quality measures work? NCQA’s quality measures rate how well health plans and clinicians do at getting the right care to the right person at the right time. We have distinct measure sets tailored to the kinds of patients in Medicare, Medicaid and CHIP, ACA Marketplace and employer plans. Our measures include over 81 measures on the care people should get. They address wellness and prevention, chronic disease management and resource use. We continuously make updates for new evidence, to further quality improvement, and to look at more issues patients and other stakeholders care about. How does NCQA develop quality measures? To develop quality measures, we first obtain scientific evidence from researchers. We then look to leading disease groups, professional associations and government agencies who develop guidelines based on that evidence. Next, we develop measures based on the evidence and guidelines. We pilot test them to make sure they work as intended. We get consensus from a broad set of stakeholders on whether measures are good enough to use. Clinically important. The measure rates something all stakeholders care about. Evidence-based. There is strong consensus on the evidence for what we are measuring. Transparent. The measure is clear about what we are measuring, why and how. Feasible, Valid, and Reliable. The measure requires reasonable effort to get accurate data. Actionable. The measure shows meaningful quality differences that providers can address. Rigorously Audited. Independent review can verify that the results are accurate. We use the measures in our Health Plan Accreditation and other programs. Public and private payers also use the measures to promote and reward quality. What are the limits on what measures can do? Measurement is a powerful tool for quality but has important limitations. We can’t measure without solid science about the right care to provide. We don’t measure things that aren’t important or show how to improve, like whether your dermatologist examined your skin. We don’t want measures that are measured for the sake of being measured. We often can’t measure quality for rare conditions or populations like smaller ethnic groups because they don’t have enough patients to get valid results. Measuring quality helps consumers and others make informed decisions about plans and clinicians. Measurement supports paying for value, which promotes high quality, efficient care. We develop new measures to rate more consumer priorities, like outcomes of care. Some payers still don’t use quality measures. Measures are just now beginning to adjust fee-for-service clinicians’ pay and it’s rare in Medicaid fee-for-service. Encourage efforts to expand measurement and public reporting. Support finding better evidence on what works best for specific patients so we can develop good measures. Advocate for behavioral measures, a critical area with few good measures. Support better data and electronic systems that reduce effort to report measures and include outcomes data that is not east to get today. Make consumer voices like yours prominent in the movement to pay for value. Submit comments when NCQA proposes annual updates to quality measures each Spring. Patients have long-term partnerships with clinicians, instead of hurried visits. Expanded hours and online access. Patients decide with clinicians what care to receive. Clinician teams coordinate each patients’ care, especially for prevention, chronic conditions, other providers and community supports. A practice needs to show a yearly assessment of their progress with whole person care, including how they address patients’ behavioral needs. Our Patient-Centered Specialty Practice program helps specialists to manage care and work with a patient’s primary care provider to deliver care. Our Oncology Medical Home program focuses on cancer patients’ unique needs. Our Patient-Centered Connected Care program brings retail, urgent care, employers and other stand-alone clinics into medical neighborhoods. For each of these practices, NCQA publicly reports their recognition. Patient-centered care is what we all want but often don’t get from our overworked clinicians and fragmented health system. Help consumers understand why patient-centered care is better for them and how to find practices. Urge government and private insurers to promote, recognize, reward or require clinicians to be in patient-centered programs. Submit comments when NCQA proposes annual updates to our standards each Spring. Long-term services and supports (LTSS) help elderly and disabled people with tasks like eating, bathing and dressing. LTSS are especially important for helping people live at home and in communities rather than nursing homes. NCQA has the only LTSS accreditation program for organizations that provide these services. LTSS Case Management Accreditation supports Area Agencies on Aging and community-based providers. LTSS Distinction supports health plans offering LTSS. More than 5 million people receive LTSS under the Medicaid program. Medicare wants states to integrate Medicare and Medicaid, including LTSS, into seamless packages for people enrolled in both programs. States are folding LTSS into managed care plans with usually little LTSS experience. Kansas, New Hampshire, Pennsylvania and Virginia require their Medicare/Medicaid plans to have NCQA LTSS Distinction. Encourage plans and providers to get NCQA LTSS Accreditation or Distinction. Urge states to require LTSS Distinction for Medicaid and Medicare/Medicaid plans. Urge Medicare to require LTSS Distinction for Medicare/Medicaid plans. Organizations that deliver care to patients must be aware and sensitive to their patient populations’ racial, cultural and language differences, to deliver the best care possible. It’s understood that by tailoring care and services to an individual’s culture and language preferences, health professionals can help bring about positive health outcomes for diverse populations. NCQA’s Multicultural Health Distinction program helps plans and providers assess and improve how well they serve patients with diverse language and cultural preferences. The program evaluates whether organizations meet or exceed Culturally and Linguistically Appropriate Services (CLAS) Standards. We list on our website the plans who have earned this distinction. Our nation is rapidly becoming more diverse, with now over 500 spoken languages. Respecting people’s language and values is a must for quality and reducing disparities. This Distinction shows that plans and providers are serious about disparities. Help consumers understand how plans with NCQA’s MHC Distinction are better at meeting diverse patient needs, offer better quality and how to find plans with the distinction. Urge individual plans and provider groups to get MHC Distinction. Urge federal and state health programs to promote, recognize, reward or require plans and providers to have MHC Distinction. For decades, employers have offered wellness and health promotion programs to boost morale, increase productivity and address health care costs for their employees. NCQA’s Wellness and Health Promotion Accreditation rates wellness program vendors that work with employers. Being clear on how to disenroll, decline participation and file complaints or grievances. Detailing privacy protections and promptly addressing violations. Letting participants agree or not to use and sharing of their data. Telling when, how and why the program uses and shares participants data. Providing information in easily understood language online, in print or by phone. Being clear about how the program measures performance and cost-savings. Ongoing performance monitoring and annual training for health coaches. Measuring performance and documenting improvement strategies. More than 70% of U.S. employers now offer workplace wellness programs. The ACA lets employers charge up to 30% more to people who do not participate or meet specific program targets like weight loss. Many consumer advocates thus fear that these programs are a backdoor to underwriting that can raise costs for people who have health conditions. Accreditation shows that program vendors provide key protections that consumers need. Encourage employers to use accredited vendors. Encourage government to require or promote accreditation of workplace wellness vendors. Designing and conducting education programs. Setting benchmarks and identifying best practices. Analyzing data to identify and understand high performers. Our expertise can speed and enhance research projects for government and foundations. Our reputation for integrity and high-quality provides a widely recognized seal of approval. Our clients include government agencies and foundations like the Robert Wood Johnson Foundation, Commonwealth Fund, John A. Hartford Foundation and the SCAN Foundation. Ask us if we can support your research, or help find agencies or foundations who might partner with you. Encourage government agencies and foundations to seek our help. NCQA’s Speakers Bureau offers our experts to present at conferences and other events. We can address all topics described above plus trends in public policy, quality improvement and health reform. For non-profits we often do this for free or travel costs.